The city of Bruges was founded between the 7th and 9th century on the banks of the Zwin and enjoyed an economic boom, stimulated by the Counts of Flanders. Thanks to the presence of the Dukes of Burgundy, Bruges shaped up to become a prestigious residential town. 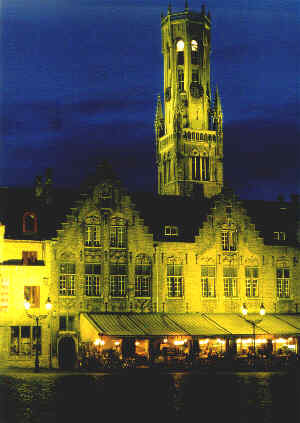 As the capital of 15th-century Flemish painting, Bruges becomes famous for its ironwork, tapestry, embroidery and lace by the end of the 16th century. Ever since the beginning of the century, the Venice of the North has been linked with the sea by means of the Channel of Zeebrugge and is today a prosperous town that jealously guards its invaluable architectural and artistic heritage. Eurocrypt 2000 was held in the Congress Center Old Saint-John. 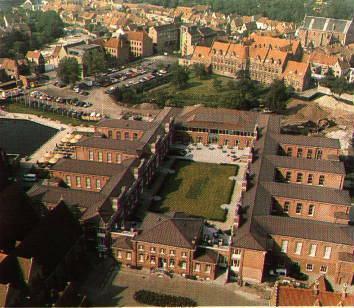 This center is located in the heart of the city, and used to be a hospital. It is restored now and designed as a modern art and conference center. Eurocrypt 2000 is organized by the members of the COSIC research group. This page is maintained by Joris Claessens and Wim Moreau. Last modified on August 16, 2000.